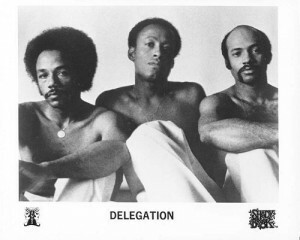 Delegation was a British soul musical group with a lengthy career, and an amount of international success. They are generally viewed in the U.S. as a one-hit wonder, based on the crossover hit, “Oh Honey” (1978). Their biggest UK success came in 1977, with the Top 30 hit single, “Where Is The Love (We Used to Know)”. Delegation was formed in the United Kingdom in 1975 by Ricky Bailey, Len Coley and Roddy Harris. Working with record producer/songwriter Ken Gold (who masterminded The Real Thing), they began releasing a series of moderately successful singles such as “The Promise of Love” and “Where Is The Love (We Used to Know)”. But their fortunes changed for the better in 1977 with the release of “Oh Honey,” a mid tempo cut that hit the Top Ten in several countries. The accompanying album, The Promise of Love, included the ballad “Mr. Heartbreak”, “Where Is The Love (We Used To Know)” and “Someone Oughta Write a Song (About You Baby),” which also charted. Coley left the band and Bruce Dunbar took his place. In 1979, Delegation released Eau De Vie, on the Ariola label and had international hits with “Heartache #9”, “You And I” and the “Put A Little Love On Me”. By 1980, Harris was replaced by Ray Patterson, and the group continued on with lesser success. They followed with an eponymously titled album in 1981 and Deuces High in 1982. All charted in Europe but not in the U.S. In 1984 Dunbar quit and was replaced by Kathy Bryant. The act recorded a couple more singles, and continued to perform through the end of the decade. The record It’s Your Turn, on Epic was successful only in France although did well on the UK club scene, and The Mix on Scorpio Records, a segue compilation of five of their greatest hits also sold poorly. Bailey reunited with Gold to form Euro-Jam Records in the mid 1990s, to repackage Delegation’s earlier recordings into new compilation albums, and reformed the group to release Encore in Europe in 1999, but this was Delegation’s final recording. Founding member Roddy Harris was my father, he sadly passed away 11.11.08.